In an effort to speed up its fiscal adjustment, the Greek government is emphasizing revenues from tourism, which is expected to set a new record this summer, euractiv.com has learned. Greece’s government and the International Monetary Fund are at odds over “contingency” austerity measures worth €3.6 billion in the event that Athens misses its budget target for a 3.5% surplus in 2018. The Tsipras government says it is ready to establish an automatic correction mechanism, but vows not to legislate specific measures, as such a move would go against the country’s constitution. EURACTIV was told that the Greek government would soon submit a second package of tax measures to the parliament for approval. A government source said that the change in taxation included activities affecting tourists, whose arrivals this summer are expected to increase. 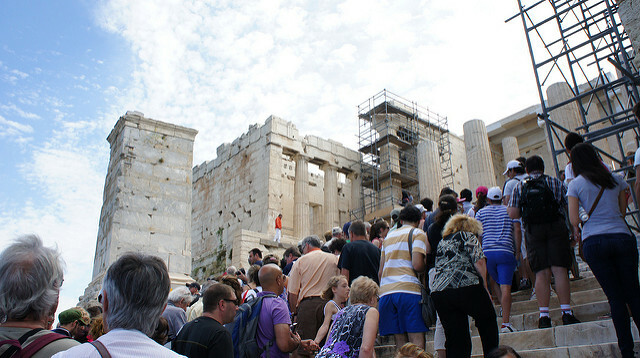 Tourism contributes 20% to Greek GDP and is considered the country’s “heavy industry”. This package of measures contains indirect tax hikes focused, among other things, on alcoholic beverages, tobacco, coffee, gaming and tourist accommodations. “To meet the fiscal targets, as a prior action, the government will adopt supporting legislation generating savings equivalent to ¾, 2¼ and 3 percent of GDP in 2016, 2017 and 2018 respectively through parametric measures,” according to a document seen by EURACTIV. According to the document, in the event that the measures surpass their targets, the Greek government could, after an agreement with its lenders, strengthen social protections, provided that the budgetary targets are secured. The Tsipras government is planning to raise the excise tax rates on beer and abolish a 50% exemption for excise taxes on alcoholic beverages for the Dodecanese islands. In addition, increased excise taxes are foreseen on cigarettes and tobacco as well as on coffee and e-cigarettes. The introduction of an occupancy tax (a tax on the rental of rooms) on hotels above two stars is also provided, as well as a permanent increase in the gross gaming revenue tax to 35% to replace a 5 cent levy on lottery games. The Greek premier was heavily criticized by the Kyriakos Mitsotakis, leader of the right-wing New Democracy party. Mitsotakis said that the new tax regime was not a “reforms” but rather a “tombstone” for Greece’s ailing economy. He accused Tsipras of being politically “immoral” and derailing the Greek economy. “The €3.6 billion contingency measures demanded by the IMF are an unreliability clause of the prime minister and the povernment,” Mitsotakis complained. “New measures will be needed […] Greece is getting discredited day by day, and turning into a failed state with geopolitical consequences,” the right-wing politicians warned. Alexis Tsipras tells EURACTIV Greece in an exclusive interview that his candidacy for the European Commission presidency on behalf of the European Left shows the solidarity of Europe’s southern people, who are suffering from the “catastrophic” social consequences of austerity policy.